One of the best ways to estimate the profitability of an agricultural enterprise is to do an enterprise budget. An enterprise budget is a simple listing of income and expenses, based on a set of assumptions. Enterprise budgets estimate profitability for agricultural enterprises. They are useful for performing breakeven analyses and can be used to select the mix of enterprises on a farm. Below is a sample budget for a 100-ewe sheep enterprise. For an enterprise budget to be useful, it is important to use your own figures. This budget is meant only to serve as an example. You can download this budget as an Excel file and use your own figures and assumptions to estimate the profitability of your sheep enterprise. Before you construct a budget for an agricultural enterprise, you first have to make some assumptions. 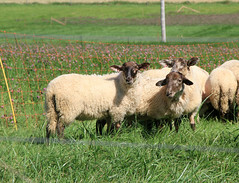 In this sample budget, flock composition is the number of breeding ewes and rams in the flock. 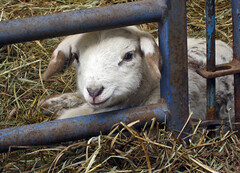 Lambing percentage is the percentage (or number ) of lambs that you will market or retain from each ewe in the flock. This includes ewes that fail to raise a lamb. It also takes into account any death losses that occur before marketing or retention. Lambing percentage is one of the most important assumptions in a sheep production budget. The figure you use will have a very large effect on profitability. You should experiment with different levels of productivity. 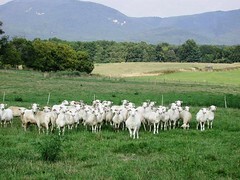 Ewe replacement rate is the percentage of ewes that are replaced in the flock each year. You need to keep enough ewe lambs to replace the ewes that die, as well as the ones that you cull. A replacement rate of 15 to 20 percent is common. You can make more rapid genetic improvement if you replace ewes at an accelerated rate. Seedstock producers tend to replace females at a faster rate than commercial breeders. In some operations, it is common to purchase replacement females. In this case, the ewe replacement rate would be zero and the cost of replacement ewes would be a fixed cost (depreciation) of doing business. Fixed costs are not included in this simple budget. The ram replacement rate is an indication of how many years a ram is kept. A 33 percent replacement rate means that you keep a ram for three years before getting rid of him. In this budget, it is assumed that breeding rams are purchased. Otherwise, the flock is closed. The income from a sheep enterprise includes the proceeds from the sale of market lambs, breeding stock, cull ewes and rams, and wool. It may also include government payments. 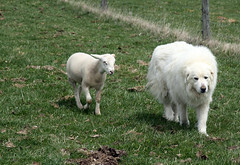 Lamb prices will vary by year, season, type and quality of lamb, and marketing method. Lighter weight lambs usually bring more per pound than heavy weight lambs. Since marketing costs aren't included anywhere else in the budget, market price should include any selling fees, as well as the lamb check-off. Prices for cull ewes and cull rams will also vary. 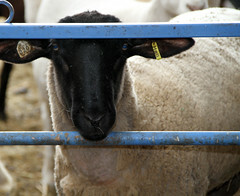 Extremely thin or fat sheep are usually discounted in the marketplace. If your "culls" are still healthy, productive animals, you can try selling them for breeding to increase their value. Another alternative is to have cull animals slaughtered and have their meat made into sausage or snack sticks. The stronger flavor of mutton will be masked by the seasoning. Wool prices vary by year, marketing method, and type of wool. In the U.S., the support price for wool is 40 cents per pound for ungraded wool and $1 per pound for graded wool. Fine wool that is skirted will bring the most money in the commodity market. Producers who direct market their wool to hand spinners and weavers may receive substantially more for their fleeces. Depending upon wool prices, wool income can be increased by participating in the government wool LDP program, which provides payments for both shorn wool and unshorn lamb wool. The wool income items will be zero for hair sheep producers or wool producers who throw their wool away or give it to the shearer. Many producers believe that the only way to make money raising sheep or to make more money is to increase income. Lowering production costs is probably a more realistic way to increase the net income from a sheep enterprise. This can be done by lowering expenses and/or increasing productivity. Feed costs are usually the largest expense associated with raising sheep and similar livestock. 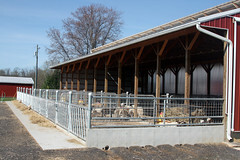 They include hay, grain, mineral supplements, lamb feed, and pasture maintenance. It usually takes from 1/4 to 1/3 of a ton (4 to 5 lbs. of hay for 120 to 150 days) to feed a ewe over the winter. There can be a lot of waste associated with feeding hay, especially round bales, so these losses should be factored into the budget. The figure for hay will be lower if the winter feeder period is shortened due to a longer growing season or an extended grazing season. The figure will be higher when the winter feeding period is longer due to a shortage of pasture or a shorter growing season. The price of hay will vary significantly by geographic location, year, type of hay, and size of bales. The amount of grain fed depends upon the production system. This budget assumes that 15 lbs. 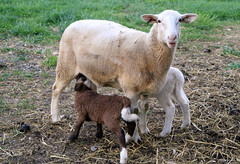 of grain is fed to a ewe during the last month of gestation (an average of 0.5 lbs. per day). It assumes that grain is fed for the first 60 days of lactation at a rate of one pound per offspring. The cost of grain fed to ewes can vary signficantly. A complete sheep feed bought at a feed store can be very expensive. Grain costs can be reduced significantly if farm grains are used and simple rations are mixed on the farm. If a high quality legume hay (e.g. alfalfa) is fed during lacation, whole corn or barley can be fed, as opposed to a more expensive mixed ration. It is more difficult to estimate salt and mineral consumption by sheep. Estimates are given on the label, but sometimes sheep will eat more or less. There are considerable differences in mineral costs. Some lambs will never see a bite of grain, whereas others will be creep fed and finished on concentrate rations. 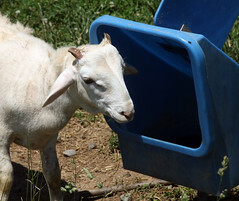 This budget assumes that lambs are creep fed, then pastured and fed a pound of grain per day for 60 days post-weaning. 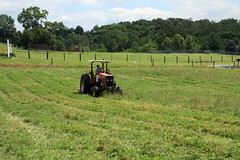 Pasture maintenance costs would include establishment, renovation,and maintenance of pasture. The next section of the budget is for health costs. Detail is provided on deworming and vaccinations. 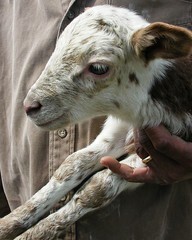 It is assumed that each adult sheep is dewormed once per year and that each lamb is dewormed an average of two times. 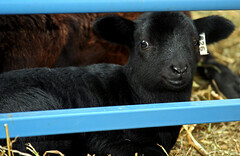 Lambs are vaccinated twice for CD-T. Ewes and rams are boostered annually. The figure for additional vet costs would include medicines. The figure does not include veterinary services. It is assumed that the shepherd his or her own vet work. If traditional wooled sheep are being raised, there may be an annual cost of shearing. This budget item will be zero if hair sheep are raised or the shepherd does his or her own shearing. It will be necessary to replace rams every few years. If a ram is saved from the flock, there will be no additional cost. Usually, rams are bought from outside flocks to keep minimize inbreeding and introduce new genetics. It is assumed that new rams will be purchased for $400. It's possible to pay less or more for rams. The rule of thumb is that a "good" ram is worth the value of five market lambs. If replacement ewes are purchased instead of raised, their cost will need to be added to the budget. The cost of a replacement ewe varies by age, breed, and registration. Unless the sheep are always kept outside, most operations will incur a cost for bedding. 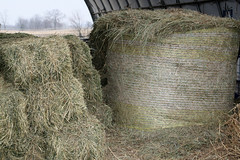 It is difficult to estimate this cost, as bedding costs vary and different types of bedding can be used: straw, hay, shavings, newspaper, etc. The best figure is one obtained from actual costs in previous years of production. 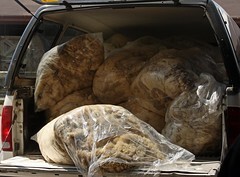 There is usually a cost associated with hauling animals to market. This cost should be included in the enterprise budget. If lambs are picked up at the farm, there will be no cost for this item. The sheep enterprise may incur various other expenses that should be included in the budget. 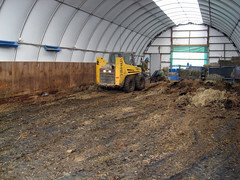 Paying someone to clean your barn would be an example of another operating cost. The last item in the budget is interest on operating money. It is the cost of using money. If you didn't raise sheep and invested the money instead, what could you earn? Sheep raising should be competitive with alternative uses of the money. The money is charged for six months at a current interest rate. Fixed costs include the dirti-5: depreciation, taxes, interest on investment, land charges, and insurance. Sometimes a management fee is included as a fixed cost. These costs are considered to be “fixed” because they generally remain the same within a production period and do not vary with the level of output. Indirect, noncash, and overhead costs are other terms used to describe fixed costs. When there are more than one enterprise on the farm, it is more difficult to assign fixed costs to specific enterprises. In this budget, the difference between income and expenses represents the return to land, labor, and capital. Ideally, you want to earn a profit above total costs every year. Several land grant universities have developed budgets for sheep production. 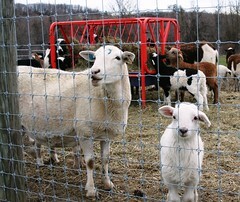 The University of Maryland has developed a more detailed budget to evaluate the profit potential of sheep. Scroll down to see spreadsheet options. Late updated 19-Jan-2019 by Susan Schoenian.